The Big Wobble: Thousands of fish wash up on Cornish beach: Deaths A mystery, no signs of pollution! 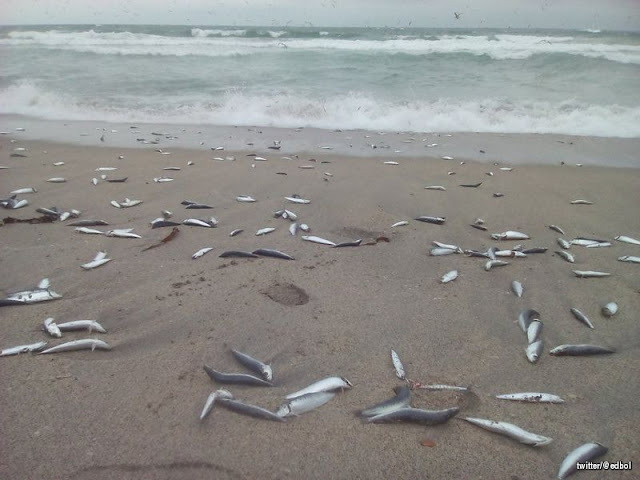 Thousands of fish wash up on Cornish beach: Deaths A mystery, no signs of pollution! Bad weather could be to blame for thousands of dead fish washing up on a beach, experts have said. Visitors to Pentewan Sands, Cornwall, said the beach was covered in herring, sardine and mackerel on Saturday. Experts described the event as unusual, especially for the time of year, but suspect recent windy weather could be a factor. The dead fish have attracted huge numbers of gulls to the bay on the county's south coast. James Wright, curator of the National Marine Aquarium in Plymouth, said events like this one usually happen in the summer months when fish, particularly mackerel, are following their prey into warmer waters, and then in turn are hunted by something themselves. "It's quite unusual for fish to want to leave the water, it's usually a result of panic, because of a predator, but at this time of year that would be unusual", he said. He suggested the weather could be a factor: "It is possible they were all caught in particularly bad weather when they were near the surface and washed up by the waves." Mr Wright said the fish did not appear to have been affected by pollution, but people should not take them home and eat them.